Introducing: Lillian Eve + A Fabulous Giveaway! Eeek! I am so excited to introduce a fabulous Atlanta-based company to you and bring you an equally fabulous giveaway straight from them. 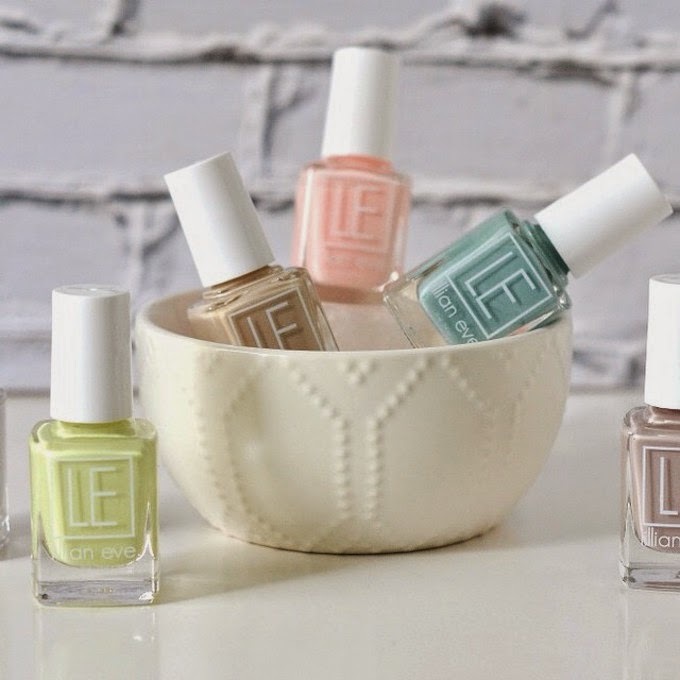 Drum roll please: today I'm introducing Lillian Eve, an artisan nail polish brand that prides itself on having the most stylish nail colors while being free of harmful toxins. Tiffany, the founder of the company, had a mission: to bring color to nail polish that wouldn't impact the wearer's health or values. Mission successfully accomplished, Tiffany! I am thrilled to have stumbled upon this brand for several reasons. First, the company is committed to being green. That means that their office is nearly completely paperless, and their computers are energy efficient. Second, Lillian Eve is 100% American made. Buy local, y'all. As much as possible. Finally, all of their materials are recyclable. Empty polish bottles and all! Keep that green-mentality flowing. And if you can believe it, there's more. 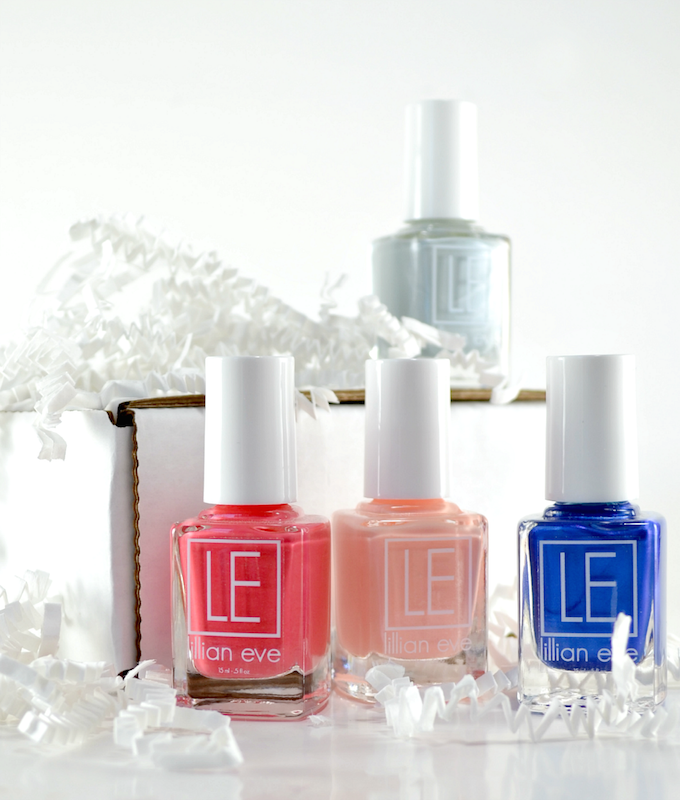 Lillian Eve has a monthly subscription box for all of your lacquer lovers out there. The LE Duo Box is $12.99 per month and brings you two polishes for the price of one in the latest on trend colors. That means by year's end, you'll collect 24 new polishes for all of your nail art needs. This month's colors were shades of blue which when paired together, look absolutely stunning. Nothing like wearing the ocean on your fingers and toes. Start by creating an account on LillianEve.com to create your Lillian Eve wishlist. From there simply enter the giveaway using the Rafflecopter widget below. One grand prize winner will receive her ENTIRE wish list, so fill it to the brim!! And runners up will receive one wishlist item. You can bet your bottom that I'm not only featuring this giveaway, but entering it as well. Who wouldn't?! 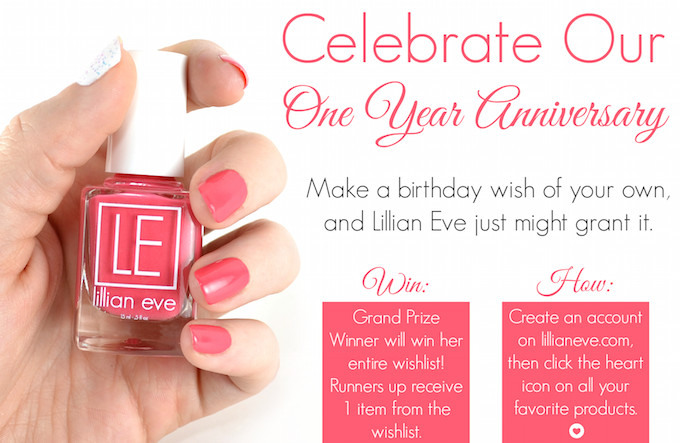 If you can't wait to win, get 15% off of your first Lillian Eve polishes with the code: probablypolkadots. Once you create your wishlist, comment below and follow me on Facebook, Instagram, and Pinterest for additional entries. Be sure to comment each time you follow! My top choice prize is the Sweet Dreams nail polish! I visited the Facebook page! I follow on Pinterest too (kendall608). I loved the color Lipstick & Heels! Plus the mint! I also visited your facebook page!